The Bigfoot® Line Array is the newest, loudest, and most powerful portable sound system on the market. Designed to cover a football field, this thunderous battery powered system is up to any challenge. 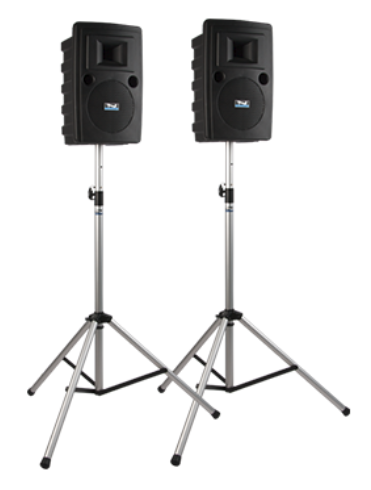 With a line array consisting of five 8" neodymium speakers and one high efficiency neodymium compression driver, the Bigfoot is ideal for large events and easily sets up in seconds. The Bigfoot is the first Anchor Audio portable sound system that offers up to four built-in wireless receivers - allowing everyone to be involved! It also boasts standard built-in Bluetooth and an optional built-in CD/MP3 combo player to easily connect to anything you'll need for an all-inclusive sound coverage. Use the Bigfoot outdoors at sporting events, military ceremonies, large auditoriums, camps, graduations, and more! The Beacon® Line Array is a battery powered portable line array sound system like no other on the market. We like to refer to the Beacon as the coolest portable sound system ever! The line array tower is securely stored in the base but unfolds in less than a minute. With a line array consisting of eight 4” neodymium speakers and three 8” subwoofers in the base, the Beacon provides a full range of clear sound that spreads evenly over large crowds. The Beacon is a unique, compact line array portable sound system that offers up to two built-in wireless receivers. It also boasts standard built-in Bluetooth and an optional built-in CD/MP3 for an all-inclusive sound coverage. The compact enclosure has a storage bag for microphones and accessories and a retractable handle with rolling wheels. Use the Beacon at sporting events, school functions, outdoor camps, military ceremonies, and more! The Liberty system has been Anchor Audio’s flagship system since its release in 1986 and is the product that defines the portable sound system industry. It was designed with intelligibility, reliability, and simplicity in mind. The Liberty is ideal for voice amplification and also great for music. The Liberty is a stand mountable portable sound system that offers up to two built-in wireless receivers. Standard built-in Bluetooth is also included in every unit with an optional built-in CD/MP3 combo player. The Liberty also has an optional built-in transmitter that wirelessly connects to one or more Liberty AIR battery powered companion speakers. Use the Liberty indoors and outdoors for school functions, corporate events, political rallies, military ceremonies, indoor and outdoor auditoriums, houses of worship, and more! For more information on any Anchor Audio system please contact you Account Manager or fill out the form below.